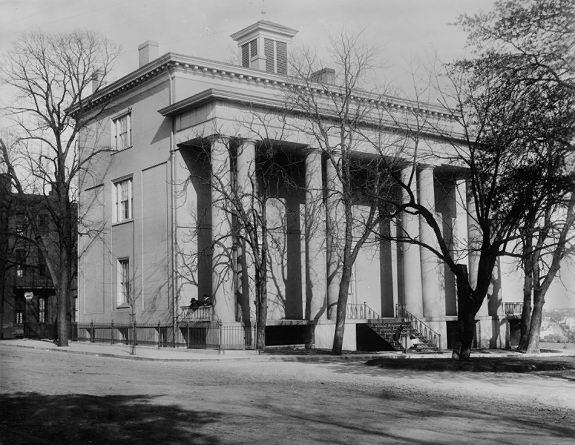 The Confederate “White House” where the Davis family resided during the war. One of their children died there. By Christmas of 1864, although still defiant, privation and defeat were in the air. 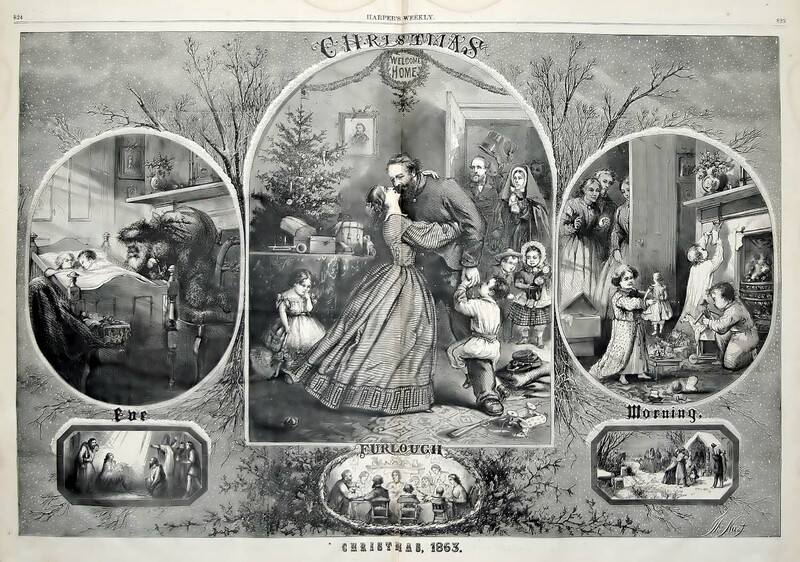 Christmas 1864 Richmond. Christmas is traditionally a celebration of abundance and cheer, but as Dickens pointed out in his famous Yuletide tale, for many it can also be a time of want and need. The South had seceded to much jubilation and overweening confidence. They would lick the Yankees in a few months and then the Confederacy would be independent and everyone would live happily ever after—except the slaves, of course. Well, by Christmas of 1864, Confederate confidence had waned drastically, with Richmond under siege and Southern forces in retreat on all fronts. 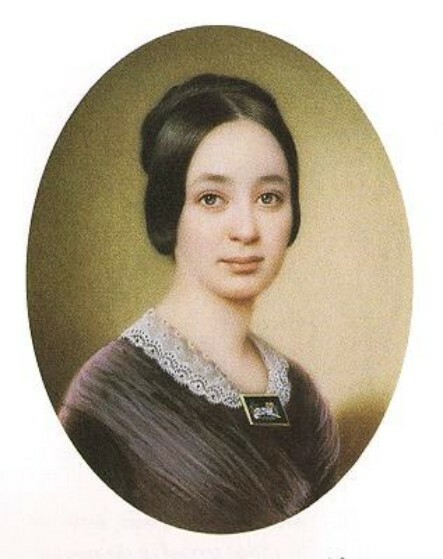 “…Rice, flour, molasses and tiny pieces of meat, most of them sent to the President’s wife anonymously to be distributed to the poor, had all be weighed and issued, and the playtime of the family began, but like a clap of thunder out of a clear sky came the information that the orphans at the Episcopalian home had been promised a Christmas tree and the toys, candy and cakes must be provided, as well as one pretty prize for the most orderly girl among the orphans. The kind-hearted confectioner was interviewed by our committee of managers, and he promised a certain amount of his simpler kinds of candy, which he sold easily a dollar and a half a pound, but he drew the line at cornucopias to hold it, or sugared fruits to hang on the tree, and all the other vestiges of Christmas creations which had lain on his hands for years. The ladies dispersed in anxious squads of toy-hunters, and each one turned over the store of her children’s treasures for a contribution to the orphans’ tree, my little ones rushed over the great house looking up their treasure: eyeless dolls, three-legged horses, tops with the upper peg broken off, rubber tops, monkeys with all the squeak gone silent and all the ruck of children’s toys that gather in a nursery closet. But the tug of war was how to get something with which to decorate the orphans’ tree. Our man servant, Robert Brown, was much interested and offered to make the prize toy. He contemplated a “sure enough house, with four rooms.” His part in the domestic service was delegated to another and he gave himself over in silence and solitude to the labors of the architect. About twenty young men and girls gathered around small tables in one of the drawing rooms of the mansion and the cornucopias were begun. The men wrapped the squares of candy, first reading the “sentiments” printed upon them, such as “Roses are red, violets blue, sugar’s sweet and so are you,” “If you love me as I love you no knife can cut our love in two.” The fresh young faces, wreathed in smiles, nodded attention to the reading, while with their small deft hands they gined the cornucopias and pasted on the pictures. Where were the silk tops to come from? Trunks of old things were turned out and snippings of silk and even woolen of bright colors were found to close the tops, and some of the young people twisted sewing silk into cords with which to draw the bags up. The beauty of those home-made things astonished us all, for they looked quite “custom-made,” but when the “sure enough house” was revealed to our longing gaze the young people clapped their approbation, while Robert, whose sense of dignity did not permit him to smile, stood the impersonation of successful artist and bowed his thanks for our approval. Then the coveted eggnog was passed around in tiny glass cups and pronounced good. Crisp home-made ginger snaps and snowy lady cake completed the refreshments of Christmas Eve. The children allowed to sit up and be noisy in their way as an indulgence took a sip of eggnog out of my cup, and the eldest boy confided to his father: “Now I just know this is Christmas.” In most of the houses in Richmond these same scenes were enacted, certainly in every one of the homes of the managers of the Episcopalian Orphanage. A bowl of eggnog was sent to the servants, and a part of everything they coveted of the dainties. The Davis family tried to make the best of Christmas, despite the lack of even basic staples. Gifts were homemade and simple. Supper was spare, but there was still a celebration. For me there were six cakes of delicious soap, made from the grease of ham boiled for a family at Farmville, a skein of exquisitely fine gray linen thread spun at home, a pincushion of some plain brown cotton material made by some poor woman and stuffed with wool from her pet sheep, and a little baby hat plaited by the orphans and presented by the industrious little pair who sewed the straw together. They pushed each other silently to speak, and at last mutely offered the hat, and considered the kiss they gave the sleeping little one ample reward for the industry and far above the fruit with which they were laden. Another present was a fine, delicate little baby frock without an inch of lace or embroidery upon it, but the delicate fabric was set with fairy stitches by the dear invalid neighbor who made it, and it was very precious in my eyes. There were also a few of Swinburne’s best songs bound in wall-paper and a chamois needle-book left for me by young Mr. P., now succeeded to his title in England. In it was a Brobdingnagian thimble “for my own finger, you know,” said the handsome, cheerful young fellow. 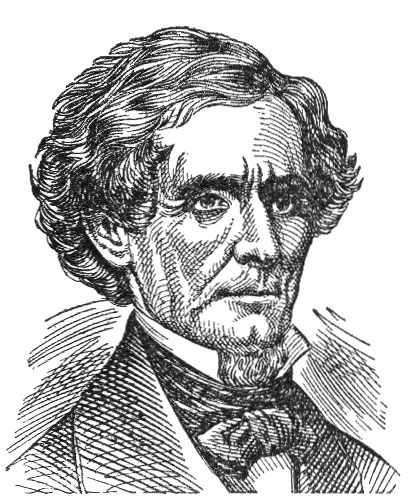 Jefferson Davis, the embattled president of the Confederacy, tried to put on his best face for the holiday and played Santa for war orphans . 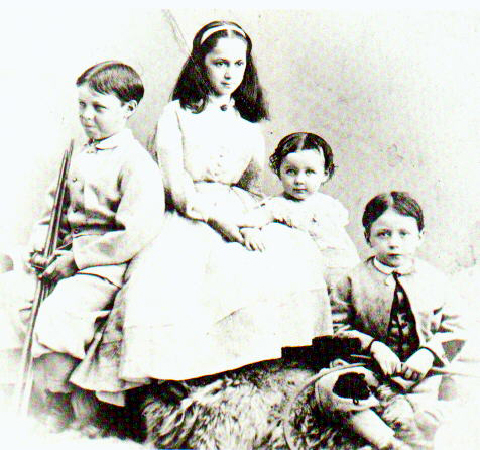 The orphans sat mute with astonishment until the opening hymn and prayer and the last amen had been said, and then they at a signal warily and slowly gathered around the tree to receive from a lovely young girl their allotted present. The different gradations from joy to ecstasy which illuminated their faces was “worth two years of peaceful life” to see. The President became so enthusiastic that he undertook to help in the distribution, but worked such wild confusion giving everything asked for into their outstretched hands, that we called a halt, so he contented himself with unwinding one or two tots from a network of strung popcorn in which they had become entangled and taking off all apples he could when unobserved, and presenting them to the smaller children. When at last the house was given to the “honor girl” she moved her lips without emitting a sound, but held it close to her breast and went off in a corner to look and be glad without witnesses. “When the lights were fled, the garlands dead, and all but we departed” we also went home to find that Gen. Lee had called in our absence, and many other people. Gen. Lee had left word that he had received a barrel of sweet potatoes for us, which had been sent to him by mistake. He did not discover the mistake until he had taken his share (a dishful) and given the rest to the soldiers! We wished it had been much more for them and him. If Christmas was threadbare in Richmond, for the Confederate soldiers at the front it was even more Spartan. The night closed with a “starvation” party, where there were no refreshments, at a neighboring house. The rooms lighted as well as practicable, some one willing to play dance music on the piano and plenty of young men and girls comprised the entertainment. 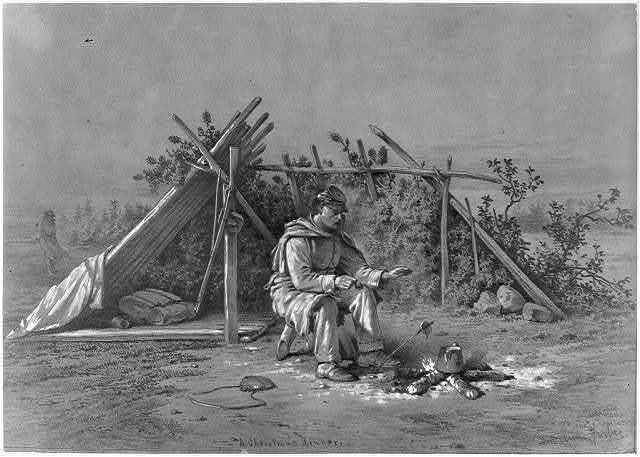 Sam Weller’s soiry, consisting of boiled mutton and capers, would have been a royal feast in the Confederacy. The officers, who rode into town with their long cavalry boots pulled well up over their knees, but splashed up their waists, put up their horses and rushed to the places where their dress uniform suits had been left for safekeeping. They very soon emerged, however, in full toggery and entered into the pleasures of their dance with the bright-eyed girls, who many of them were fragile as fairies, but worked like peasants for their home and country. These young people are gray-haired now, but the lessons of self-denial, industry and frugality in which they became past mistresses then, have made of them the most dignified, self-reliant and tender women I have ever known — all honor to them. 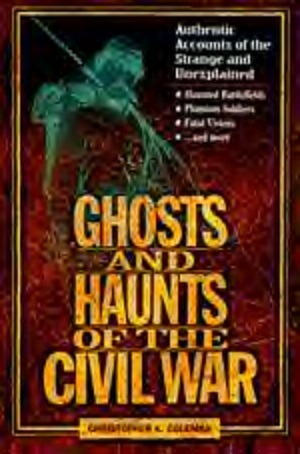 For more stories of the Civil War, see Ghosts and Haunts of the Civil War, and The Paranormal Presidency of Abraham Lincoln. Now in print, Ambrose Bierce and the Period of Honorable Strife, chronicles the famous American author’s wartime experiences. 1863 was a pivotal year for all, even if many, North and South, could not see it yet. During the summer, the North had made three stunning victories, all at the same time: on the Fourth of July Grant took Vicksburg, General Meade beat back Robert E. Lee at Gettysburg and Rosecrans had outfoxed and outmaneuvered General Bragg in the heartland of the nation, forcing the elite Army of Tennessee back all the way to northern Alabama and Georgia. Yet all was not lost for the Confederacy: Lee’s invasion of the north had not succeeded, it is true, but he withdrew in good order and his army recrossed the Potomac to fight another day. In the Western Theater, Bragg had retreated from Chattanooga, only to turn and whup the Yankee army of Rosecrans at Chickamauga; and the Rebels at Vicksburg were paroled to fight another day. Both sides still had hope of eventual victory; both sides still had concerns and doubts. At home, loved ones grieved for those lost and worried for those still at the front. 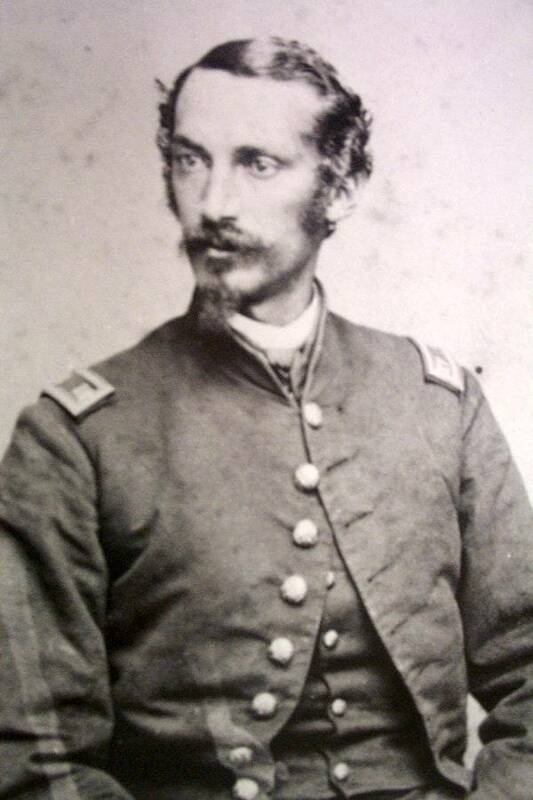 Henry Kyd Douglas, Stonewall Jackson’s former staff officer, spent Christmas 1863 in the Yankee prison camp on Johnson Island. Henry Kyd Douglas, who had served under Stonewall Jackson until the latter’s death at Chancellorsville in the spring, was captured at Gettysburg and spent Christmas in durance vile as a guest of the Yankees at Johnson Island prison camp. The Rebel prisoners did get Christmas boxes from home, but only after their captors had inspected them to make sure the contents were “safe” to be distributed. Kyd notes in his memoirs: “There came a carload of boxes for the prisoners about Christmas which after reasonable inspection, they were allowed to receive. My box contained more cause for merriment and speculation as to its contents than satisfaction. It had received rough treatment on its way, and a bottle of catsup had broken and its contents very generally distributed through the box. Mince pie and fruit cake saturated with tomato catsup was about as palatable as “embalmed beef” of the Cuban memory….” There was also a bottle of brandy, but Yankee guards had emptied its contents and refilled it with water. 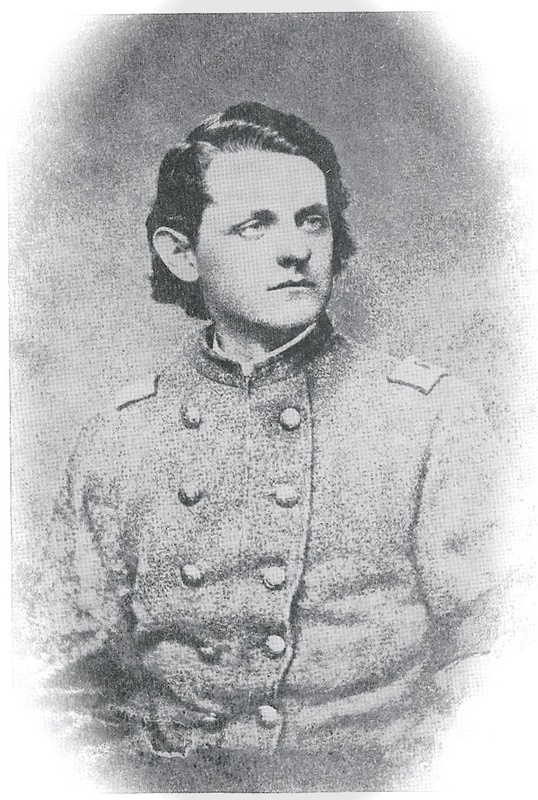 Frederick Cavada was Colonel of the 114th Pennsylvania Zouaves when captured at Gettysburg in 1863. After the war he returned to Cuba and led Cuban patriots fight Spanish occupation. In the North, Christmas was more cheerful overall; but the absence of fathers, brothers and sons was still sorely felt. Happy was the household where their men could get furlough from the front for the holiday; but these were not many. Three year regiments which re-enlisted–like the Ninth Indiana–were given a month’s furlough as a reward and were all send home, some in time for Christmas. For those lucky enough to receive leave, it was indeed a merry holiday. In the White House during the Lincoln years, like many northern households, there was no Christmas Tree in evidence. Nonetheless, the Lincoln family observed the holiday in a manner that would have done Charles Dickens proud. Earlier in the war, Mary visited the hospitals at Christmas to tend to the wounded; she also raised thousands of dollars to provide Christmas Dinner for those without and similarly raised money to provide oranges and lemons for the soldiers when she heard of the danger of scurvy among the troops, whose regular military rations lacked such amenities. Mary went about such charitable work quietly and without fanfare, even as her many detractors North and South labeled her as vain and selfish. 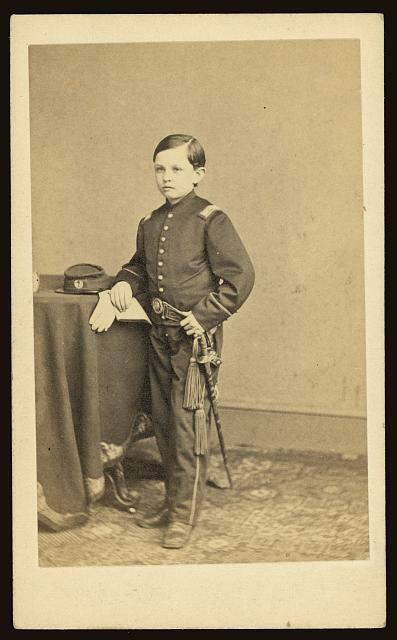 Tad was fond of dressing like a soldier, having gotten Secretary of War Stanton’s special permission to wear an officer’s uniform. Young Tad also started a holiday tradition which is still observed to this day. Tad befriended a turkey that was being fattened for Christmas Dinner, nicknaming him “Jack.” Tad burst into a cabinet meeting to plead with his father to spare Jack’s life. Most fathers of that day would have rewarded their son with a whipping for breaking in on them, but Lincoln was more indulgent than most, especially after losing his middle son Willie to the fever. President Lincoln therefore drew up a formal pardon and officially signed it, sparing Jack’s turkey neck to gobble for another year. Christmas Dinner on the Picket Line by Edwin Forbes. Many men on both sides had to endure Christmas in cold comfort. 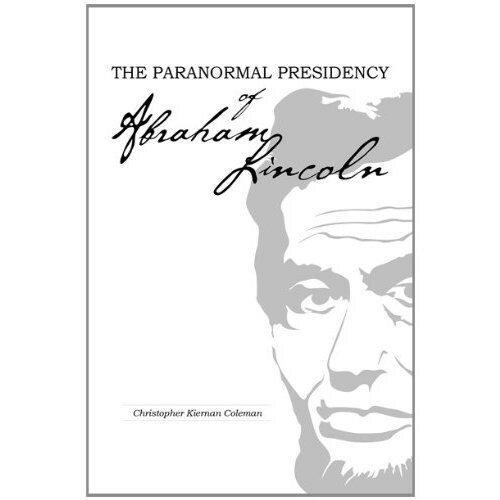 For more about Lincoln and his family, see The Paranormal Presidency of Abraham Lincoln, and for curious lore about the Civil War, read Ghosts and Haunts of the Civil War. Now in print is Ambrose Bierce and the Period of Honorable Strife, about the famous author and his service in the Civil War.